Our Utah genealogists are available to research on location. They will find and analyze the best records available to further your family history research. They can search the archives and libraries in Utah, as well as help you with other special requests. The Utah Division of Archives and Records Service contain helpful documents for genealogical researchers dating back to 1850. These records include death certificates, land records, legislative bills, mining claims, and incorporation records. They also have catalogs, name indexes, and research guides to aid researchers in locating other types of records. The Church History Library of the Church of Jesus Christ of Latter Day Saints (LDS) conserves articles that focus on the history of the church. They include worldwide membership records, primarily dated from 1877 to 1983. This library is the only location where membership records from 1949 to 1983 can be located. Records of congregations (known in the church as wards and branches) are also held here. The library also contains patriarchal blessings dating from 1833; a patriarchal blessing is a blessing given to an individual by an ordained church leader, a patriarch. Utah Division of Archives and Records Servicecontain helpful documents for genealogical researchers dating back to 1850. These records include death certificates, land records, legislative bills, mining claims, and incorporation records. They also have catalogs, name indexes, and research guides to aid researchers in locating other types of records. The Family History Library in Salt Lake City is the largest genealogical repository in the world. It is owned by the Church of Jesus Christ of Latter Day Saints (LDS). It contains 3,400 databases, 3.1 million microforms, 4,500 periodicals, and 310,000 books of worldwide family and local histories. Utah genealogists can find civil, church, immigration, ethnic, military, and Mormon records. The strongest points of the collections are genealogical information from the United States, the British Isles, Scandinavia, Europe, Mexico, and parts of Germany. The archives contain genealogical records from other countries and regions throughout the world. Available records are listed in the FamilySearch Catalog. The Utah State Historical Society cares for thousands of genealogical items in their collection including photographs, books, manuscripts, and maps. The archives contain newspapers and periodicals, including the Utah Historical Quarterly. Topics in the society’s archives include records of early settlements and the Great Basin colonization, mining records, and information on the Mormon pioneers. Some of their records cannot be found in any other archive. The Daughters of the Utah Pioneers Society was established in 1801. Their mission, in their own words, is to “preserve the memories of the early men, women, and children who came to Utah between 1847 and 1868.” They maintain a Pioneer Memorial Museum in Salt Lake City that contains pioneer artifacts, an extensive collection of photos, and a small but respectable archive of family histories. Our Utah genealogists around the state can access 100 smaller satellite museums and repositories throughout the state. The society publishes a yearly periodical about the history of Utah. The periodical consists of biographies of early Utah pioneers, information about historical sites, and documents about pioneer the migration to Utah. So far, members have collected and prepared thousands of these biographies. The Marriott Library at the University of Utah is home to several special collections, including manuscripts, print & journal, rare books, and even the Utah ski archives. The Doris Duke Oral History Collection resides here, which is devoted to collecting oral records from the Native American people. The University Archives and Records Management division maintains over 500 archival collections of the institute’s history, 30,000 cubic feet of records, and over 17,000 campus architectural drawings. The Salt Lake City Public Library focuses on collecting information on ethnic pioneers such as the Mormons who immigrated to Utah. It is known as one of the better genealogical collections in Western America. The Sons of Utah Pioneers Society maintains many area histories, Mormon Battalion histories, manuscripts, biographies, historical magazines, American soldiers lists, and photographs. The SUP society aims to preserve the heritage of early pioneers in Utah territory and western United States. Genealogists can read or submit pioneers stories to the society’s database. The Logan Public Library houses the Virginia Hanson Special Collections, which is dedicated to increasing public appreciation of Logan County’s history. It currently holds over 7,500 print, manuscript, and film items. 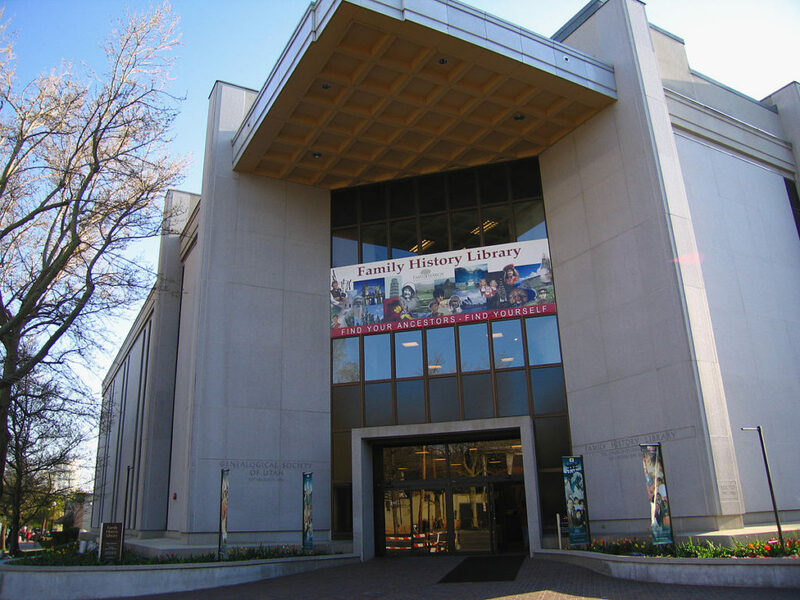 The library is connected to the Family History Library in Salt Lake City and can request items from the larger archive. The Harold B. Lee Library at Brigham Young University (BYU) is home to the L. Tom Perry Special Collections Archive. This archive contains 300,000 books, 9,000 manuscript collections, and nearly 750,000 photographs. This archive focuses on original documents from Mormon history, articles from the History of BYU, family histories, as well as journals from leaders of the LDS church. The Dixie State University’s Val A. Browning Library contains local family and historical records in its Special Collections archives. It holds articles documenting the history of Dixie State University, as well as information on the areas of Washington County, the Arizona Strip, and the Big Muddy region of Nevada. The Merrill Library at Utah State University contains over 1.5 million volumes, 621,000 books, 300,000 government documents, 100,000 maps, and 13,000 current serial subscriptions. The Special Collections & Archives Department has a manuscript section containing articles from local and international sources. This includes the Jack London Papers, the second largest collection of London materials in the world. The manuscript collection also has a national reputation for their Mormon history and American folklore articles. The Gerald R. Sherratt Library’s Special Collections at Southern Utah University includes 180,00 volumes of genealogical history. Their manuscript collections include many topics including dozens of family histories. Other notable collections are the Inez Cooper Collection, which focuses on the history of women’s rights, and the Daniel B. McGarry Collection which contains newspaper clippings and personal writings. The Brigham City Library is an excellent genealogical source for information on Utah settlers. The archives include oral histories collected by the Daughters of the Utah Pioneers. The library also specializes in genealogy instruction and have texts on genealogical research. The Stewart Library at Weber State University has many genealogical records, including thousands of printed and electronic books, journals, online databases, videos and DVDs, maps, music CDs, and microfilms. The Magna Ethnic Museum has many genealogies of Greek immigrants. The museum specializes in the mining history and preserves the history of those who built the mining economy throughout the years. Many of the people involved were from diverse ethnic groups. Several Native American tribes have historically and/or currently live in Utah. Among these tribes are the Utes, Bannocks, Navajo, and Shoshone. The word Utah comes from the Ute word meaning “people of the mountains”. Researching Native American genealogy can be difficult, but there are excellent resources in Utah devoted to preserving the culture and family histories of the Native Americans. Utah genealogists can find oral records from the Native American people in the Doris Duke Oral History Collection at the University of Utah Marriott Library. Another resources is the Edge of the Cedars Museum, a museum containing original materials from the navaho Archives and ancient relics from the Pueblo People (Anasazi). The Utah State Board of Education is responsible for material from the Utah State Commission on Indian Affairs as well as maps, photographs, and oral histories. Our Utah genealogists specialize in researching several types of documentation and are not limited to the list above. For more information or specific inquiries about our genealogists, please feel free to contact us.